Rockets coach Jeff Van Gundy used to call them "Yao haters," those critics who always found something to knock about Yao Ming's game. He was too slow, too stiff. Not strong enough, not aggressive enough. Good, but not great. At least not No. 1-pick great. Anybody want to knock him now? Yao isn't just the best center in the league this season with averages of 26.5 points and 9.9 rebounds per game. He's one of its most valuable players. Maybe even the Most Valuable Player. The Warriors know it. They watched the 7-foot-5 Yao dominate them twice in a 10-day span, scoring the Rockets' first 11 points in Houston two weeks ago, then dropping 38 points and 18 rebounds at Oracle Arena on Thursday. The Heat know it. Yao torched Miami for 34 points and 14 rebounds in November and thoroughly outplayed Shaquille O'Neal, who managed just 15 points and 10 rebounds. Yao's numbers represented the most anyone outside of Patrick Ewing has put up on the former MVP, and the most an opposing starting center has ever outscored O'Neal by. The Mavericks know it, too. Yao scored 36 points in 36 minutes against Dallas, and he wasn't just taking advantage of the Mavs' early struggles. In all those games, Yao's numbers were eye-popping enough, but it's how he got them that was most impressive. He's scoring on inside layups and dunks, unblockable fadeaways, open jumpers and free throws. He even hit a three-pointer to beat the shot clock against Golden State in the second half. So much for all the Yao hating. "The guy gets better every year," Warriors forward Troy Murphy said. "His conditioning and strength is unbelievable. Anytime he gets around the basket, you used to be able to body him a little bit, make him take a jump shot." Now, Yao almost welcomes the jumper. He made 27 of 49 shots in two games against the Warriors, who would still rather take their chances making him shoot than sending him to the free-throw line. Yao hits 86 percent from the foul line -- a clip almost unheard of for a legitimate center and one better than every Warrior except guard Keith McLeod (97 percent). No wonder coach Don Nelson says containing Yao is becoming impossible. "I don't know that you do anymore," Nelson said. "He's gotten so good." Yao has upped his point production every season. He's gone from playing 29 minutes a game as a rookie to more than 36 in his fifth year -- he played a career-high 49 minutes in Friday night's 112-101 double-overtime loss to the Los Angeles Lakers. Defensively, he clogs the lane, intimidates, and adds 2.3 blocks a night. Yao passed Ralph Sampson earlier this season for third-place on the Rockets' all-time blocked shots list and has 609 after a career-high eight Friday. (Moses Malone is No. 2 with 758, while all-time NBA leader Hakeem Olajuwon had 3,740). As Yao's game has reached another level, Nelson jokes that "I'm gonna try to get his brother, 'Wow Ming.' "
There is no brother, of course -- Yao's family is no exception to China's one-child policy -- but there is another countryman ready to wow. Seven-footer Yi Jianlian is projected to be a lottery pick in next summer's draft, and Yao knows him well from the Chinese national team. "He's very athletic and long. Full of energy. Very smart," Yao said recently. "What he needs first of all is to get stronger and have people teach him how to play better basketball. We don't really have that big-man coach in China. Not like a real big-man coach. "His team is pretty much run-and-gun. For him, all he knows is 'take and shoot,' and defense. Not a lot of post moves. Maybe at the CBA's level he can do some, but if he really wants to move onto a higher level, it's really difficult. "So I think the most important part is to find a guy who can train him to get better. Because he's very smart. He will learn very quickly." Yao learned from Ewing in Houston. He learned from coach Rudy Tomjanovich and now Van Gundy. 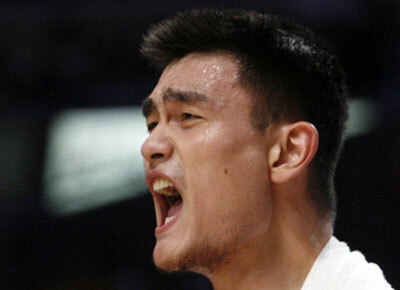 And now, the entire league is learning to turn the Yao hate into Yao love. The Rockets are a 50-win team when Yao and Tracy McGrady are healthy, as evidenced by their 2004-05 season. They're a 30-win team without them, as evidenced by last year's injury-riddled season. With McGrady once again out indefinitely with back spasms, the pressure will be on Yao to put up even greater numbers. Anybody want to bet against him?